Saturday night, after listening to some Voice of Greece Jazz, I happened upon Radio Strange – Outpost No. 7. This pirate deserves some recognition for the station’s homage to retro 8-bit & spacey sounds. I couldn’t tell if I was listening to an NES game soundtrack or an episode of Lost In Space. There’s even a Beatles song thrown in the mix…with a twist. Good fun. 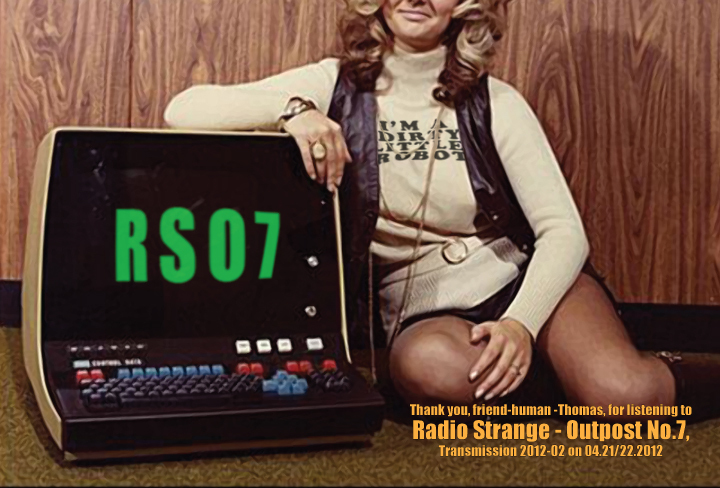 This entry was posted in Broadcasters, Pirate Radio, QSL Gallery, Recordings and tagged 8-Bit, 8-Bit Retro, Pirate Radio, Pirate Radio Recordings, Radio Strange, Radio Strange - Outpost No. 7, Shortwave Pirate Radio, Shortwave Radio on April 24, 2012 by Thomas. I did just get a QSL from their 1215 UTC broadcast of Sunday April 22nd though! I’ve got the ‘card’ posted over at http://bowqsl.posterous.com if anyone is interested. Thanks, Terry. I should have known this as I live near the Moog town of Asheville, NC. In March, I got the opportunity to tinker with a Mini Moog for a few days. It produces the most amazing analog sounds. Yes! I saw that too, Tim. May have to dig through the recording and post a link to it. Send me yours, if you like. I heard them here in Central Iowa as well. Definitely a very unique and enjoyable station. I’ve seen screen shots of their sign-off on the waterfall, where the signal sort of bows out, kind of like a stone being dropped in a pond. Strange indeed!